Volunteers are one the main reasons why SWESA is able to provide affordable programs to its members. Surveys show that over 150 SWESA members are willing to help out as volunteers. This is an amazing show of enthusiasm. SWESA’s Board is indebted to the volunteers who have already made huge contributions to developing this Seniors Centre. Your help makes everything at SWESA possible and your enthusiasm is the welcoming face to our membership. SWESA’s Board is very appreciative of every volunteer hour that is donated. 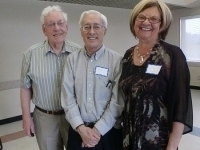 Our Volunteer Appreciation Tea was held on May 16th. Thank you all! SWESA is pleased to announce that we have a Volunteer Coordinator and team to develop a full volunteer program where people have fun pursuing their interests and are well recognized for their contribution of time and talent. Please contact our Program Coordinator at programs@swedmontonseniors.ca for contact information. If you would like to become a volunteer, click here for the form. If you have already been volunteering, you can fill out a form next time you are at SWESA or click here for the form. There are so many ways in which you can contribute to this project with your time and experience. Look at the opportunities below for something that fits your interest and time. Click on the highlighted titles for more information. Fill out an application form or contact us to talk about volunteering at SWESA. Office Assistant – help with photocopying, typing, answering the phone, receiving and filing forms and payments and other office activities. 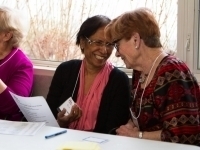 Let’s Walk Team Leader – planning and leading participants on one hour walks in the community. This position is filled – thank you! Volunteer Committee Member - join the team of people developing the volunteer program at SWESA. Marketing and Communication Committee Member – join the team helping to promote awareness of SWESA and get the word out on programs and events. Fundraising Committee Member – join the team of people developing different ways to raise revenue for SWESA programs. Assistant Photographer - Capture the spirit of SWESA membership by taking photos at events, working alongside the occasional use of a professional photographer. Seniors Column Writer – write a short column for seniors four to five times/year using all the SWESA program information and adding a paragraph of your own thoughts. Newsletter Editor and Writers – work with the Board to develop a newsletter for SWESA. Photo Archivist – take on this project to organize SWESA’s electronic and printed photos to best reflect our history. Information Gatherer-Cultural - research on the internet and phone to develop a list of cultural organizations in southwest Edmonton. Information Gatherer-Community Newsletters – research on the internet and phone to develop a list of newsletters and confirm the editor’s interest in linking to SWESA. If you are willing to help out occasionally – at monthly luncheons, social events and public displays, add your name to the SWESA Volunteer Roster. When help is needed you will be called. If you can help that day, great. If not, no problem. Kitchen Assistant – help prepare food and clean-up afterward. 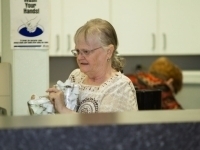 Set Up/Clean Up – set up table & chairs; return tables & chairs to storage; sweep floor. Servers – set up the food table, replenish food as needed. Registration desk – manage sign-in & sell tickets.